Crafted with nutrient-rich, organic superfoods and grass fed collagen to create the best tasting and healthiest snack for all of life's adventures. You've got nothing to lose. Your order is covered by our 60 day, 100% money back guarantee. WHY OUR BARS ARE BETTER? Our bars are crafted using the highest quality, nutrient-dense, and antioxidant-rich superfoods! Most other food bars contain cheap, low quality ingredients, large amounts of refined sugar, gluten, soy, corn, oats, legumes, denatured proteins, "natural" flavors, and preservatives. That's why we wanted to make an on-the-go snack that contains nutrient-dense, organic superfoods such as acerola cherry, spirulina, chlorella, blueberry, turmeric, ginger, coconut MCT oil and more while avoiding all of the low quality ingredients found in other bars. Collagen is the most abundant protein in our bodies and is found in bones, muscles, skin, blood vessels, tendons and the digestive system. Traditional diets contained much larger amounts of collagen than the standard diet of today. It has been shown to help heal the gut, reduce join pain and degeneration, improve skin health and elasticity, boost metabolism, and contains amino acids that protect cardiovascular health. Our collagen is sourced from healthy, grass fed cows. Our bars contain MCT oil derived from organic coconuts which is a superior brain fuel because MCTs convert to ketones within minutes of ingestion and rather than being stored as fat. In multiple studies, ketones have been shown to be both neurotherapeutic and neuroprotective. Your heart health can also derive benefits from MCTs since human studies have shown them to help lower total lipid levels and improve cardiovascular health. We love making healthy products...but even more we love making healthy products that taste delicious. Our Dark Chocolate Chip and Apple Cinnamon flavors are so delicious you will never believe you're eating a healthy dose of organic superfoods in each bar. Our bars contain both organic coconut and MCT oils (derived from organic coconuts) which are superior brain fuels as the MCTs found in these natural oils convert to ketones within minutes of ingestion rather than being stored as fat. In multiple studies, ketones have been shown to be both neurotherapeutic and neuroprotective. Your heart health can also derive benefits from MCTs since human studies have shown they help lower total lipid levels and improve cardiovascular health. Organic Pumpkin Seeds - Contain a wide variety of nutrients such as magnesium, manganese, copper, protein and zinc. These little nutritional powerhouses also contain free-radical scavenging antioxidants. Organic Flax Seeds - Known for their high omega-3 fatty acid content beneficial for cardiovascular health and protecting blood vessels against inflammation. They are a very good source of fiber and have been shown to aid in digestive tract function. Organic Coconut Butter - Contains medium chain fatty acids that increase energy expenditure and have antimicrobial properties that prevent illness. It is one of the few foods that contain lauric acid, a fatty acid that is anti-fungal, anti-bacterial and anti-viral. Himalayan Pink Salt - Contains over 90 trace minerals that are incredibly health supportive. Organic Blueberries - Antioxidant and phytochemical rich powerhouses. High in potassium and vitamin C and may lower your risk of heart disease and cancer. They also have wonderful anti-inflammatory properties. Organic Spirulina - A micro-algae that is 60% protein by weight and contains all essential amino acids. Spirulina is loaded with iron and vitamin K as well as other pigments with antioxidant properties. Organic Chlorella - High in protein, fatty acids (including EPA), magnesium, zinc, iron, and chlorophyll, plus plenty of phytonutrients. It is also a powerful detoxifying superfood that helps your body eliminate unwanted metals and toxins. Organic Acerola Cherry - Contains 65 times more vitamin C than an orange. The antioxidants and vitamin C contained in acerola helps boost the immune system, strengthen the liver, improve skin and improve your body's ability to regenerate tissue. Organic Turmeric - Quite possibly the most powerful, natural, anti-inflammatory food on earth. Organic Ginger - Loaded with nutrients and bioactive compounds that have powerful benefits. Known to help stabilize blood sugar, fight inflammation, improve digestion and more. Your order will be shipped within 1 business day! All orders receive 2-3 day priority shipping so you won't have to wait long to get your Superfood Bars! Yes, on orders of 3 or more you will receive 100% FREE shipping. Our Superfood Bars are shelf-stable at room temperature for 6 months. They do not need to be refrigerated but will last even longer if you keep them refrigerated until you're ready to eat them. No, these Paleovalley Superfood Bars are free from GMOs, gluten, grains, corn, soy, and dairy. 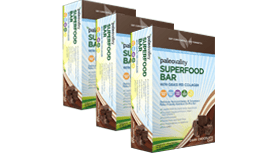 What is the difference between Paleovalley Superfood Bars and other bars on the market? There is really no comparison. 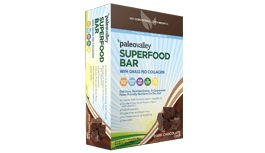 In every aspect Paleovalley Superfood Bars are a superior choice. Other bars are full of overly-processed ingredients and loads of sugar. They frequently contain gluten, grains, oats, soy, rice protein, peanuts and other legumes, and fillers that give the bar weight but no health benefits whatsoever. We use all certified organic superfoods so you get a diverse spectrum of nutrients and enzymes in each bar along with grass fed collagen–a protein containing vital amino acids that are sorely lacking in the standard American today. Our Superfood Bars are also cold-processed, gluten free, soy free, grain free, legume free, and contain no refined sugars, artificial sweeteners or sugar alcohols. Many so-called “healthy” bars use very cheap ingredients that simply don’t have any significant health benefits. Our goal was to make a truly healthy, nutrient-dense superfood bar that was healthy AND delicious…give it a try and we know you’ll agree! Do Paleovalley Superfood Bars contain sugar? We do not use any refined sugar, artificial sweeteners, or sugar alcohols whatsoever. Our bars are very low in natural sugars and additionally contain healthy fats to help stabilize blood sugar. While other bars can contain 20+ grams of sugar per bar our Dark Chocolate Chip and Apple Cinnamon bars only contain 3 and 4 grams of natural sugars from organic ingredients per bar. There are 12 bars per box. orders of our Superfood Bars, simply by subscribing!